I love Joni Mitchell's work. There's something wonderfully outlawish about her. Of course, I was interested when Gathered Light came through the mail, and I quickly saw that this was not just your usual book exploring the work of an artist. No, instead, it is really a book about how art affects us personally, what we, the audience, bring to the artistry of another. It's a book about how a song can change our life. The famous, like critically acclaimed writer Wally Lamb, weigh in with how Joni impacted him . The not-so-famous share stories about how Joni's art sparked their own. 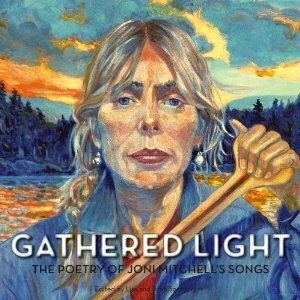 The book isn't just filled with interpretations of Joni's songs; it's also brimming with poetry and stories from people inspired by Mitchell. I'm thrilled to have Lisa and John Sornberger here talking about the book. What sparked the idea of this book? Caroline, I've loved Joni's work since I was fifteen. I wrote a high school paper on her called "Joni Mitchell: Portrait of a Poet and a Painter." It was...well- a high school paper...pretty bad, but my teacher loved it. I like thinking the idea was in the back of my mind for nearly forty years, then one day- January 1, 2011, the spark caught fire! I brought the idea to my husband and co-editor, John, and to my writers group, The Thread City Poets. Their enthusiasm fed the fire. You’ve got everyone from Wally Lamb To David Geffen talking about Joni Mitchell. How did you choose who you chose to comment? Did anything surprise you? A writer or other person I admire would come to mind, and I'd sit with the idea of how the person might be a fit, in terms of my criteria, in terms of what I thought might be Joni's... and if it resonated in my midline, I'd contact them. I bounced some of them off John too- his instincts are really good! Many other choices were strictly intuitive. Some who wanted to contribute couldn't due to other commitments. I firmly believed that those who were meant to be included would! And there are others I wish I'd thought to invite, in retrospect. Did anything surprise me? Yes, absolutely. I was surprised by the willingness of the participants to respond to an unknown poet (aka me). I was surprised and moved by David Geffen’s openness when he said he loves Joni. The fully “meant to be” quality about our experience still fascinates me. Doors opened for us, and help came when we needed it. I discovered the joy of working single-mindedly for extended periods, so that Joni could be fully recognized as a serious poet, not just a singer-songwriter. There are stories here and poems, inspired by Mitchell. Why do you think her influence is so powerful? I think her honesty, and willingness to speak her truth without reservation is key. What I loved so much is that many of the entries are stories in and of themselves, jumpstarted by a reaction to a Mitchell song. For example, Wally Lamb writes about the tragic life of a female prisoner, someone else writes about how their life changed from hearing a song that that person felt spoke directly to them. What’s so interesting to me is that this is really what great art does: it speaks to us and it isn’t just what it brings to us that changes us, it’s what we bring to the art. How we interpret it to fit our own lives. Would you agree? I like your statement, Caroline, it speaks to the “rich exchange, (a phrase from Joni’s “Jericho”) involved between a great artist and those who are touched by her art. This attests to the power of Joni’s influence that you mentioned. Her poetry is such an eloquent expression of the human story. It transcends gender, race, age, religion, politics. She has an incredible gift for translating multi-sensory experience into artful, astute language. It seems to me that she makes lightning-quick connections- her senses taking in so much, then her gift of distilling her thoughts and feelings and perceptions down to universal truths. We are drawn to the work because her truths resonate with our own. No artist would have such a huge following and wide appeal if the work was simply personal. It’s larger than that. One of our contributors, Edmond Chibeau, addresses this beautifully in his essay “California: Against Autobiography”. I also noticed a lot of writers writing about how “the ages we wear for this world are not real”--that listening to the Mitchell songs reminds us of feelings that are universal. They show us who we really are deep inside. There’s also a whole lot pointing out the traveling themes Joni Mitchell uses, the restless nature of life. Why do you think we’re so drawn to that? Funny, I hadn’t thought much about that “ageless” quality people wrote about, but yes, it is definitely woven throughout the book. As I think about it, it makes sense of why many of us have listened to Joni more days than not throughout our lives- her insights and ongoing exploration of emotions inspires us to go deeper, back to our most essential, timeless selves. I think one reason people wrote about Joni’s traveling themes and the restless nature of life is because writers and other artists are, by nature, explorers. I believe that many of us write/ create as an attempt to make sense of life, to give clarity and meaning to our experience. And when those words are shared and received, there is a genuine exchange, a sense of shared experience. Besides which, I think it would be pretty hard to write about Mitchell’s work without noting these themes- they are abundant. Kim Addonizio says, “She knew me before I knew myself.” I think a lot of people respond to Mitchell because of the raw honesty, the way she lays herself bare. I feel that that’s something perhaps that we are all trying to stumble toward. Do you agree? Yes. When we hear or witness someone who is brave enough to risk revealing their truth- it can free us to do the same. Don’t we all, on some level, long to express who we are at the core, to share our genuine selves, and to understand others? To know and be known… We all have our own personal stories…it’s the intersection where we meet and recognize each other that intrigues me. Is it this way for you too? Someone recently pointed out to me that it’s not just that Joni “gets” us- but that we understand her as well. As the process moved on, I was surprised and delighted to hear from Joni that this book could complete a circle- I’m paraphrasing, but it was something along the lines of sending the work out into the world, and the sense of completeness of the communication, when one knows how it has been received, on a personal level. She said our project had such warmth, and heart, sight unseen. I hope we have expressed that in our book. I hope she received it in that spirit. So, of course, I have to ask: does Joni Mitchell know about this book? Has she seen it? She has known about it since very early on. We decided we wouldn’t write it without her sanctioning it- it seemed kind of pointless otherwise. She did so based on the concept, because it focuses on her poetry, not her personal life. At least that was the pure intent. I am afraid because it touched such deep places in people, their truths may have come close to crossing that line in some moments. I am not sure. Anyway, Joni showed her support and enthusiasm by letting us photograph one of her gorgeous paintings for the cover, and reworked her poems especially for our book. Whether or not we accomplished what we set out to do. Did we show, through our collective individual responses, that Joni is an incredibly powerful poet who has affected multitudes of people? That was the point. Also, for there to be a kind of reciprocity by letting her know her gifts were deeply received, and life-changing. Does that shine through? I think about the poems that weren’t covered, and wish they had been. I may want to explore this further. Did we talk about the poems enough, or emphasize our own experience of them too much? It was challenging, to strike a balance between “heart and mind”. To whatever extent we did, I’m grateful. Your questions were great- am I too intense? Is there anything else? Hoping we can talk more. Thank you for this happiness, Caroline.